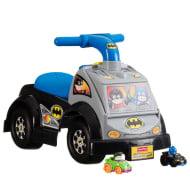 Fisher-Price is a major manufacturer of children's toys suitable from birth to age 4+. Designed for both girls and boys, they aim to promote learning and development through play. Fisher-Price also sells products that encourage toilet training and feeding. The toy range includes rockers, swings and gyms for babies, activity centres, electronic toys, dolls, train sets, first-step walkers, bath and outdoor toys.